Energy is considered both as a disciplinary core idea and as a concept cutting across science disciplines. Most previous approaches studied progressing energy understanding in specific disciplinary contexts, while disregarding the relation of understanding across them. Hence, this study provides a systematic analysis of cross-disciplinary energy learning. On the basis of a cross-sectional study with n = 742 students from grades 6, 8, and 10, we analyze students’ progression in understanding energy across biology, chemistry, and physics contexts. The study is guided by three hypothetical scenarios that describe how the connection between energy understanding in the three disciplinary contexts changes across grade levels. These scenarios are compared using confirmatory factor analysis (CFA). The results suggest that, from grade 6 to grade 10, energy understanding in the three disciplinary contexts is highly interrelated, thus indicating a parallel progression of energy understanding in the three disciplinary contexts. In our study, students from grade 6 onwards appeared to have few problems to apply one energy understanding across the three disciplinary contexts. 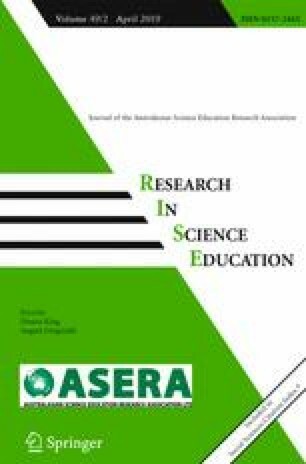 These findings were unexpected, as previous research concluded that students likely face difficulties in connecting energy learning across disciplinary boundaries. Potential reasons for these results and the characteristics of the observed cross-disciplinary energy understanding are discussed in the light of earlier findings and implications for future research, and the teaching of energy as a core idea and a crosscutting concept are addressed. The online version of this article (doi: 10.1007/s11165-017-9632-4) contains supplementary material, which is available to authorized users. We thank the city of Hamburg for funding this research as part of the alles>>könner project, and we acknowledge the support from all participating teachers and students. We owe special thanks to Ilka Parchmann for the development of the chemistry items and her substantial participation in the discussion of our findings. We are very grateful to David Fortus for all his productive comments on this manuscript and for allowing this work to be summed up during a research stay at his research group. Finally, we would like to thank the anonymous reviewers who invested their time and expertise for the revisions of this work. van de Schoot, R., Lugtig, P., & Hox, J. (2012). Developmetrics: a checklist for testing measurement invariance. European Journal of Developmental Psychology, iFirst article, 1–7. doi: 10.1080/17405629.2012.686740.